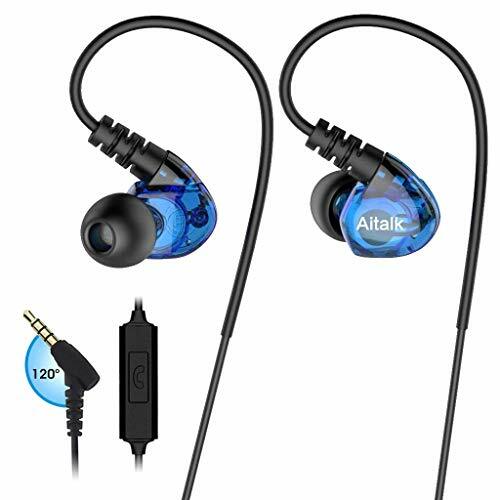 ♪ COMFORTABLE IN THE EAR ♪ With a total of 3 tips for each ear size, you are guaranteed of a comfortable experience with these fitness earbuds. The tips also fit perfectly to deliver high quality bass sound that is pure and free from surrounding noise. With the earphones, jogging and runs will not be a pain anymore as you will get the chance to enjoy music all along. The earphones also stay in the ears without causing any discomfort. ♪ PREMIUM SOUND QUALITY & NOISE ISOLATION ♪ The workout headphones have a high-quality sound output that is crisp and clear. They can provide a great range of sound and can achieve deep bass. The noise isolation technology is able to filter out unwanted external noise for the best experience. Whether you are receiving a call or just listening to music, you can be assured of a crisp sound even in busy environments where there is a lot of noise. ♪ MIC & REMOTE INCLUDED ♪ With included mic and remote, it is much easier to operate these earphones. Functions like play/pause, skip, and hands-free calling are possible with the remote. The mic also ensures quality sound during calls. ♪ FIRM IN-EAR GRIP DURING WORKOUTS ♪ The sport headphones are lightweight and feature an earhook design for great in-ear attachment during physical exercises and activities. The sweatproof design also keeps them guarded during workouts. The wired earbuds are thus perfect for running, jogging and all kinds of workouts. ♪ WARRANTY ♪ The running earbuds are of a quality design that ensures durability and great functionality. They are designed to provide quality music and withstand sporting and outdoor activities without malfunctioning. In case of any issues, a refund or replacement is guaranteed without any costs. We are here to ensure your full satisfaction. If you have any questions about this product by RooRuns, contact us by completing and submitting the form below. If you are looking for a specif part number, please include it with your message.